Do you have any idea what the idea is behind their placements? On 30th between Laurel and Olive, where they are not much needed since there are almost no parked cars and plenty room to ride free of traffic, they paint these things. But north to approx. Redwood with almost solid parked cars they leave blank. I ride that stretch often and get very tense past Olive trying to avoid opening car doors and speeding traffic. Don, I had the exact same reaction to the sharrows as you did. In fact, I think they are an affirmative problem the way they are placed because most drivers don't know that a sharrow represents the proper lane position for a cyclist - from my (extremely) informal survey, most drivers seem to think it is a signal that they should expect bikes in the road. So, the City puts the sharrows in the wide section, over the canyon where there is plenty of room for everyone (even if cyclists aren't required to be on the shoulder, most (including me) go there when riding over Switzer) but then, when cyclists have to climb the hill into S.Park or the hill towards Redwood, the sharrows disappear - where we are slowing (because of the hill) and where the lanes get narrow because of the parked cars. I could see motorists thinking that cyclists don't belong in the lane in those areas there because the sharrows disappeared. I think the current placement (and, more importantly, disappearance) creates a real potential for conflict. At any rate, I just got off the phone with Ed Clancy, the Mayor's bike czar (for lack of a better term). I explained the issue. He is going to look into it to see if they are done with the sharrows in that section or if they just didn't get it finished. Stay tuned . . . . I also would like to see a clear definition of the meaning of the sharrows very well publicized. They started showing up a couple years ago and I've seen no official explication of their purpose in the media. A few years ago I'd have said a series of articles in the UT would do it, but of course nobody sees that any more (with very good reason). I suppose TV is the only mass media left. Could Mr. Clancy get something out there? 1. No PR Department here at the city. 2. Shared roadway markings, or “sharrows,” are contained within the California Vehicle Code, as far as I know. So folks should know about them. 3. We’ll also try to remind folks of these assets. 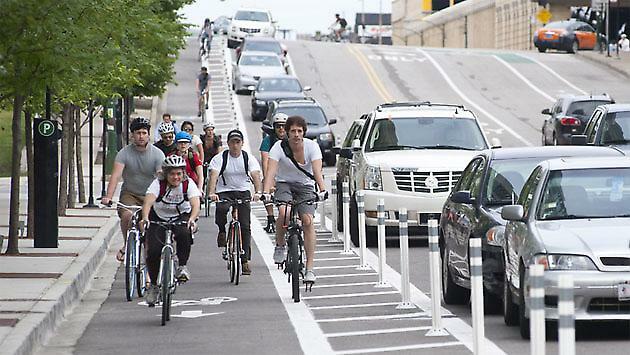 Bike routes provide shared use with motor vehicle traffic within the same travel lane. Designated by signs, Bike Routes provide continuity to other bike facilities or designate preferred routes through corridors with high demand. Whenever possible, Bike Routes should be enhanced with treatments that improve safety and connectivity, such as the use of “Sharrows” or shared lane markings to delineate that the road is a shared-use facility." “[e]nvironmental quality, public health, recreation and mobility benefits through increased bicycling”. 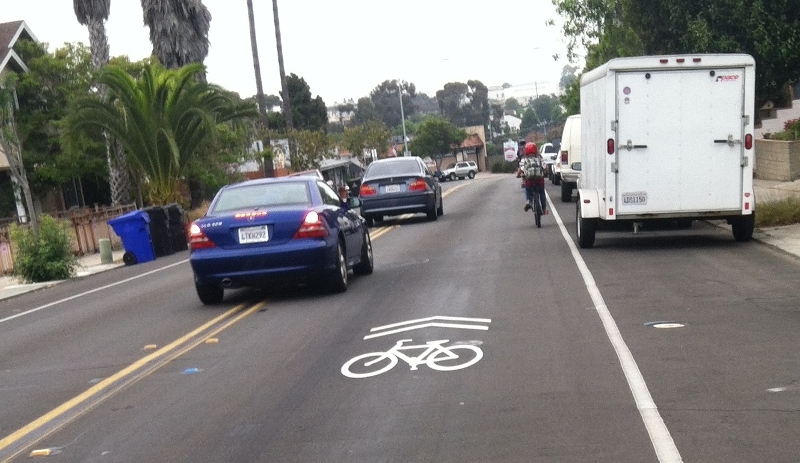 In the last year, San Diegans have seen an increasing number of shared-lane markings, also called “sharrows”. Sharrows are appearing everywhere: Adams Avenue, Park Boulevard, Broadway, El Cajon Boulevard, Grand Avenue, Voltaire Street, Chatsworth Boulevard, Hotel Circle South, Pacific Highway and more. However, these sharrows are being used as a cheap band-aid instead of implementing real change on our roadways that would increase the number of people riding their bicycle for transportation or recreation. 10 year old girl riding to school on Voltaire Street with drivers passing at over 30 mph. Are we prioritizing free vehicle curbside parking over child safety and health? Is this the best we can do? For starters, San Diego’s Bicycle Master Plan recommends sharrows on roadways that are too narrow for bike lanes. Sharrows are recommended on roads that have a minimum width of 14 feet. Bike lanes are recommended on roads that have a minimum of 15-17 feet. El Cajon Boulevard, for example, has three travel lanes in each direction – it has more than enough room for a bike lane. In an evaluation of sharrows in 2010 by the FHWA [pdf], the paper revealed that the percentage of riders (compared with other modes of transportation) didn’t increase with the presence of sharrows. most fundamental attribute should be low-stress connectivity, that is, providing routes between people’s origins and destinations that do not require cyclists to use links that exceed their tolerance for traffic stress, and that do not involve an undue level of detour. The report revealed that in order to determine whether road segments provided low-stress connectivity, the evaluation criteria would be based on whether a segment of the road was suitable for children, based on Dutch bikeway design criteria and represented the traffic stress that most adults would tolerate. Dutch standards have been proven on a population basis to be acceptable to the mainstream population, since bikeways built according to those standards attract essentially equal male/female shares and high levels of bicycle use for all age groups. (By contrast, cycling in the U.S. is about 70 percent male, with very low participation rates by older people). Installing a bicycle facility marking that has not demonstrated an ability to increase the number of bicycle riders on roads that foster speeding by motor vehicles is not an effective strategy to increase the number of riders. If the City of San Diego is truly serious about making change that will get more people riding a bicycle, they’ve got to start implementing some real change in redesigning our streets. And sharrows are not the solution to redesigning our streets or increasing the number of people who can rediscover the joy of riding for both transportation and recreation. Edit: I made an edit above regarding the the FHWA study that was referenced. The paper studied the effects of sharrows on driver behavior around bicycle riders which was included in the conclusions. The paper's authors also counted the number of riders before the implementation of sharrows and after which revealed no statistically significant increase in mode share after sharrows were striped. I've contacted the authors of the study to inquire why they didn't think to include the cyclist counts as part of their conclusion and will update this post if I learn more. Last May, sharrows were placed on Adams Avenue. Last December the sharrows were removed from Adams Avenue in preparation of the street being resurfaced. The removal of the sharrows got some local media attention as well. I finally had a chance to ride on the Adams Avenue this past week and took a few photos of the new sharrows that were placed about a month or so ago. I'm not sure why it is so difficult for departments at the City to communicate with one another to avoid duplicating work and wasting precious dollars. For more on what sharrows actually are, read this writeup from Aaron Garland. 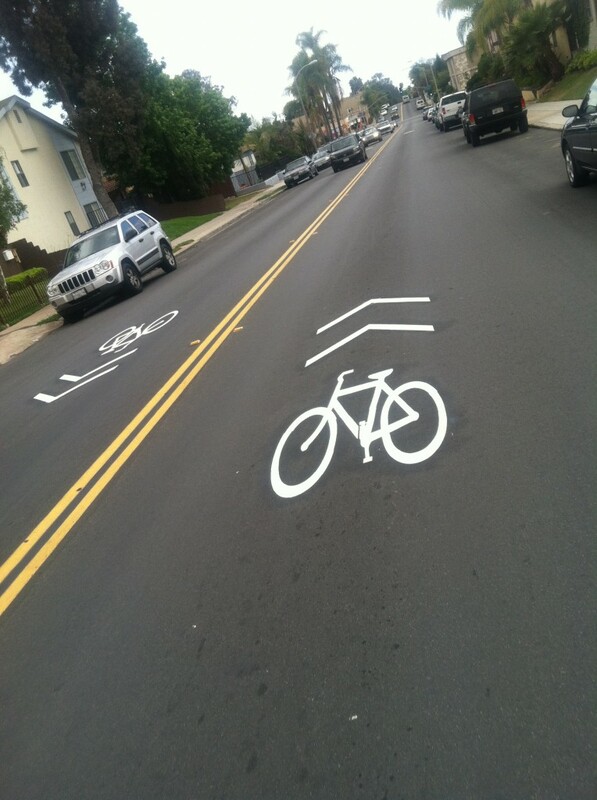 Have you seen the new sharrows on 6th Avenue between Robinson Avenue and Ash St? They were put in on the freshly repaved street along with the new "Bikes May Use Full Lane" signs. What do you think of the new sharrows? For years, Hotel Circle North has had poor quality roads filled with potholes along with an extremely narrow bike lane. San Diego cyclists will be relieved to learn that this street will soon be getting a much needed upgrade. According to the City's Senior Traffic Engineer, Siavash Pazargadi, the street is scheduled to be repaved in February 2012. After an inspection of the bike lanes on Hotel Circle North, Pazargadi agreed that the bike lanes were indeed too narrow and would be widened in coordination with the resurfacing team. It is a relief to learn that the City has learned from their earlier (costly) mistake, the downsides arising in not coordinating with the resurfacing team.